Naivasha, a town located along the Rift Valley in Kenya, is known for its robust horticulture and tourism industries. In recent years, prime residential developments have been initiated in the area driving up the need for exclusive shopping malls to serve the growing affluent population. Buffalo Mall will be the first such mall in the town. As completion nears of the much anticipated Buffalo Mall Naivasha, it heralds the latest stage of shopping centre development in Kenya’s fast growing retail landscape. 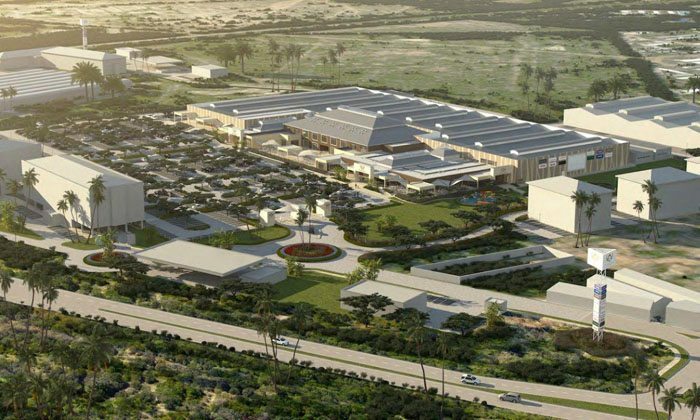 The developer, Buffalo Mall Developments, has set its sights on targeting Kenya’s secondary cities with Buffalo Mall Naivasha being its first project in Kenya. The principals of the company have a long track record of developing and managing similar projects in Europe, including in the emerging markets of Central and Eastern Europe. Buffalo Mall Naivasha is being developed in partnership with Delamere Holdings, with senior debt finance provided by Housing Finance Company of Kenya (HFCK). Buffalo Mall Naivasha, billed as the gateway into the Rift Valley, is located at the junction of Moi South Road and the Trans African Highway on the northwest edge of Naivasha town. Phase One is due for completion in November this year and will total over 7,400 sq. m. (79,653 sq. ft.) comprising a supermarket and a retail gallery. Phase Two will add a further 14,000 sq. m. (151,000 sq. ft.) upon completion in mid 2016. The shopping centre is situated at the heart of an 18 hectare (44.5 acre) master planned site which features a range of complementary planned developments including a business hotel, a process and packaging facility, apartments, hospital, petrol stations and car servicing. The development of Buffalo Mall Naivasha has generated considerable interest from Kenya’s leading retail brands seeking to target Rift Valley consumers with over 95% of Phase One already leased. Tuskys, one of the four giant supermarket chains in the country, is the anchor tenant having leased 3,861 sq. m. (41,544 sq. ft.) of supermarket premises plus 450 sq. m. (4,842 sq. ft.) of loading areas in Phase One. In addition Tuskys has leased a further 2,409 sq. m. (25,920 sq. ft.) in Phase Two. A selection of the in-line tenants includes: Java House, Mimosa Pharmacy, Optica, Healthy U, City Walk, Wine Gallery, One Way, Rift Valley Leather, Chapa Copy, Micos Drycleaners and Laundry. Housing Finance Company of Kenya (HFCK) is the developments financing bank and will also have a branch within Buffalo Mall. Buffalo Mall Naivasha features a striking modern design and benchmarks the latest international standards. The professional and technical teams assembled for the development drew from both international expertise and local experience and knowhow. The Canadian concept architect worked closely with the local planning architect to design a comprehensive master plan envisaging a phased delivery of each of the development components. The traffic flow design and car parking layout were reviewed by a leading UK traffic specialist in order to avoid the all too typical jam at entry and exit. The development team’s engineers and architects ensured that the building reflected the project brief to create a low energy, low environmental impact ‘green’ building. To achieve this, the public areas and retail premises benefit from a system of ‘passive cooling’, calculated using the stack effect principle. All the light fittings are LED, requiring a fraction of the energy of conventional fittings while offering a considerably greater lifespan. All irrigation water for landscaping and grey water used within the building is derived from the outflow of the water cleaning station, a device imported from America, which utilises the latest technology in environmental waste management and recycling. Upon completion, the project as a whole will be submitted for an environmental efficiency rating, based upon international best practice and will be the first building in Kenya to be considered on such a criteria.